Visiting the London attractions can be hard on the wallet but if you pre book your visits here you could save a considerable amount of money on tickets for popular attractions like London Bridge, The Shard, The Tower of London, The London Eye, Madame Tussauds and much more. Make the most of your visit to the capital without breaking the bank. Where do I use my Attractiontix voucher code? Choose the tickets you wish to book and select your dates and quantity. Once you are happy click ‘Book Tickets’. You will now be taken to your shopping basket. Underneath your ticket description, you will find ‘Do you have a discount code?’ followed by a text box. Any discounts will be automatically deducted and displayed in the total price. Continue with your order by pressing ‘Checkout Securely’. "Check out the money saving tips section of the AttractionTix blog for loads of great advice on saving money buying tickets." AttractionTix is the online ticket specialist for attractions and theme parks around the world. Thousands of tickets are available for the greatest destinations in the UK, Europe and beyond With their secure online booking you’ll receive instant confirmation for your tickets, and in many cases, you can print them out at home for your convenience. Through AttractionTix you can find exclusive offers and the best ticket prices around - and should you find a ticket offered cheaper by another reputable ticket provider, they’ll happily match the price. Shows, cruises, tours, zoos, theme parks and more - whatever you’re looking to see and experience, check out our AttractionTix discount codes before you order a ticket, and pile saving upon saving. Discover your inner child at Disneyland Paris, a magical world where fairytales are real and childhood dreams come true…. it’s even closer than you think! AttractionTix's cheap Disneyland Paris tickets give you admission to both of the Disney theme parks - Disneyland Park and Walt Disney Studios Park - so you won't miss a single second of the magic. Their 1-day Disneyland Paris tickets mean you can enjoy the fun even faster! 1-day tickets are Gate-ready e-tickets so there’s no fuss and nothing to redeem - just walk straight up to the gates and enter the parks! AttractionTix UK offers great deals on tickets for attractions across the globe but also for many must go to places in the UK too. Visit big attractions in London like The Shard, The Tower Of London, Ripley's Believe It Or Not, Hampton Court Palace and more. As well as London you can find tickets for other cities in the UK such as Edinburgh, Dublin, and Yorkshire. Whether it's a Guinness Storehouse tour, The Royal Yacht Britannia, Lightwater Valley Themepark or the Ghost Bus Tour you can find tickets for it all at AttractionTix. And, there's even more! Find tickets for places in the Rest of the UK like Blackpool Tower, Cadbury's World, The Beatles Story in Liverpool and much, much more. What kind of products do AttractionTix offer? AttractionTix offers you a wide selection of local, national and international attraction tickets including Theme Parks, Sightseeing Tours and much more. Travel as far as Florida and make great savings when you book online using AttractionTix who supply exclusive deals to handpicked tours and attractions. What're the benefits of booking with AttractionTix? When booking with AttracttionTix, you can expect an abundance of benefits including low prices, no booking fees incl Credit Cards, instant vouchers delivered to your email, easy and secure booking, exclusive offers and thousands of tickets to choose from. Once you have booked online with AttractionTix, you will receive an email confirming your booking. you E-Ticket will be attached to this email and it is essential you keep this safe as it is proof you have purchased your tickets. You will need to print your E-ticket off as it is essential you take it with you to your experience. AttractionTix gives you access to attraction tickets and theme park tickets all over the UK & the world. Grab a Attractiontix Discount Codes so you can save money on your big day out. 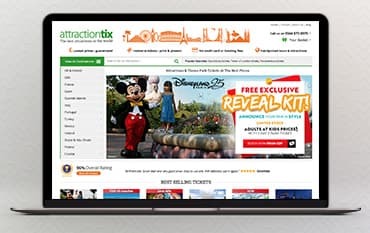 AttractionTix can hook you up with genuine e-tickets and arrange entry for attractions, theme parks, and landmarks, simply print out your tickets at home. You’ll also find tickets to the big Florida parks like Walt Disney World and Universal Orlando as well as Siam Park in Tenerife and Disneyland Paris. No matter where you’d like to visit, AttractionTix have got the tickets available at the click of a button.